Marcedes Lewis caught 16 passes for 226 yards in 16 games this season. With Lewis set to be a free agent, he’d like to make sure he sticks around to enjoy some of that success after being a part of a combined 14 wins over the last four seasons. Lewis finished the season with 16 catches for 226 yards, but didn’t score a touchdown. His 13 catches were the fewest since his rookie season, but he proved durable enough to play in all 16 games for the first time since 2012. 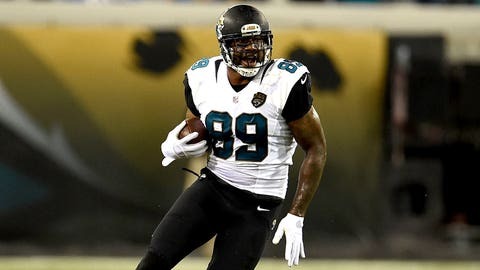 The 10-year veteran said he’s hopeful of striking a new deal with the team before free agency begins that will allow him to finish his career in Jacksonville. “You rarely see players play 10 years for one team, let alone finish their career (with the same team), so it’s something that I want to be able to do,” Lewis said. “Hopefully we can get it done before all the other stuff even starts, if it’s possible.